This review will be quick. There’s a lot of preparing to do before the Oscars, and I recently caught up on this movie. Meet The Westons. The film is based on a play by Tracy Letts, and the cast includes but is not limited to Meryl Streep, Julia Roberts, Margo Martindale, Chris Cooper, Benedict Cumberbatch, Abigail Breslin, Ewan McGregor, AND A PARTRIDGE IN A PEAR TREE! It’s really obvious that this was based on a play, because it doesn’t transfer to film very well at all. There’s nothing cinematic about it all, and to be honest, at times it can be a bit of a bore. But we all know what the big attraction to this film is: the acting. Okay, I’m going to be honest with you know even if it means losing some of my moviegoer credit. 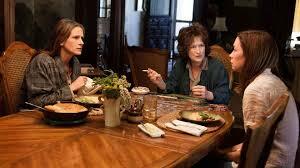 Prior to August: Osage County, the only film with Meryl Streep in it that I had seen was Fantastic Mr. Fox. This was my first time seeing how good she really was. And OMIGOD, is she good. I can’t wait to see more of her movies after this. Everybody else in the cast is wonderful, in fact. I can’t really pick out one from another, because literally every one of them seems to be campaigning for an Oscar. Julia Roberts is very good, but Julianne Nicholson has one very powerful scene. So, that’s my quick little review of August: Osage County. Nothing special, nothing really new, but worth checking out for the performances alone.